Well here we are, time to wrap up this month of mermaids. 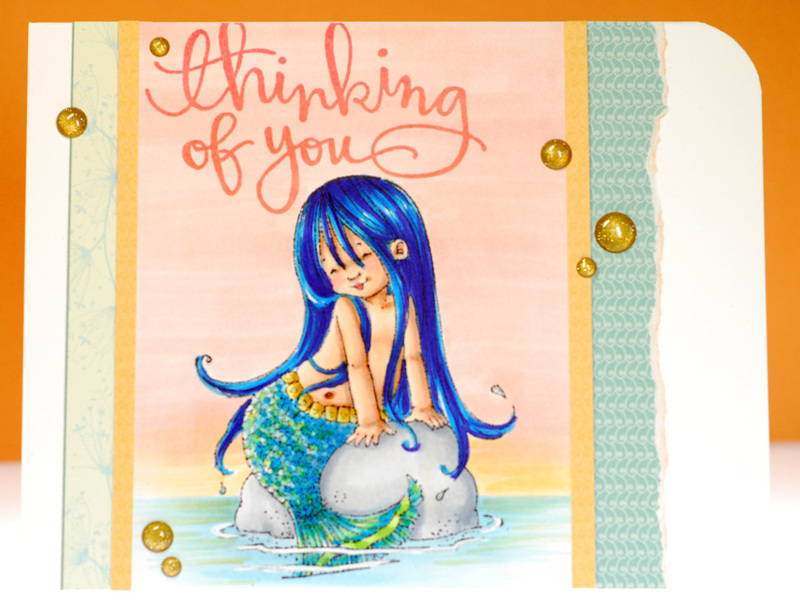 I've had so much fun making all these mermaid cards and I kinda don't know what to do now, LOL! Aw, I'm sure I'll think of something. And its not like there won't be mermaids joining the rotation later this summer as well. As good as I did getting many stamps inked and onto cards there are still a handful sitting on my desk waiting for their turn. Thanks for joining me this past month and I hope to see you again tomorrow! Ok friends, I'm off to work. We are in the middle of a heat wave here and everything is getting hot, hot, hot! I'm definitely thinking about spending the afternoon down at the lake. Sure the water is still freezing cold but it will be a welcome relief. Ok then, gotta get movin'. 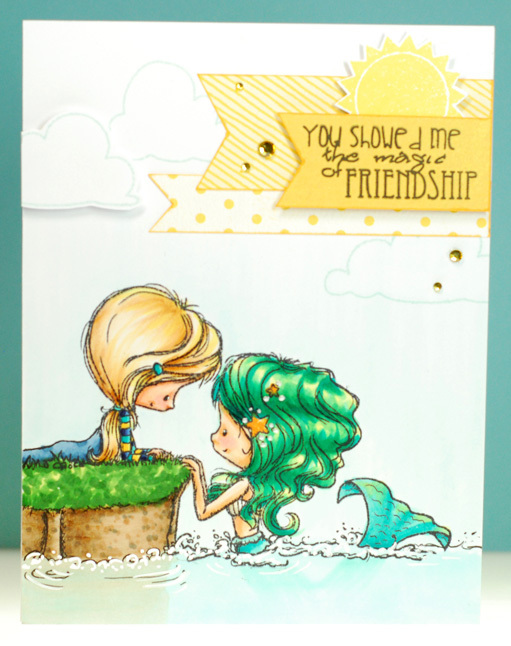 I was lucky enough to win a Kraftin' Kimmie challenge just in time to use my resulting gift certificate on the brand new mermaid set called Fin-tastic Friends and when it arrived in the mail a couple days ago I just had to get this gal on a card ASAP. I LOVE how relaxed and chill she looks and imagined that if mermaids had a tropical resort to hang out at she would be there running the place, LOL! Ok, time for me to scoot. Keep cool and I will see ya tomorrow! And it looks like this lovely mermaid may be having some dreams of her own... though they are most likely filled with dancing across the sand rather than riding the waves. Mermaid Queen is the name of the SOG digital stamp gracing today's card and as you can see, I went to town with the blues and aquas. I am SO happy with how her hair turned out, it is one of the rare times when it looks just how I pictured it in my mind. 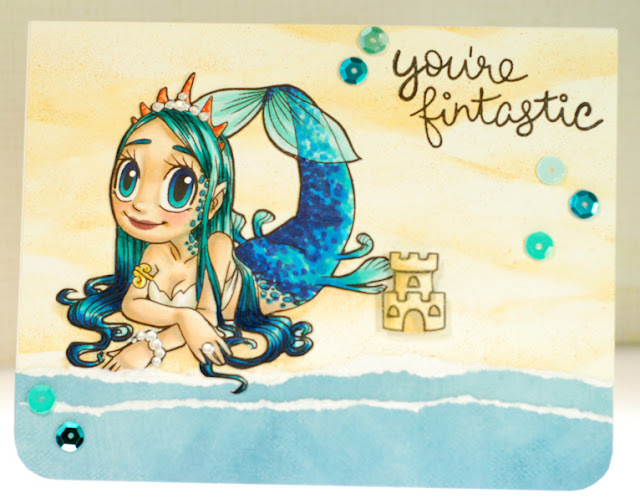 There is also more of the Fintastic Friends set from Lawn Fawn, originally I was just going to use the sentiment but then I thought it would be funny if she was passing time building a little sand castle as well. I don't know about you but I can't believe how quickly this week has flown by... it can't be Friday already! 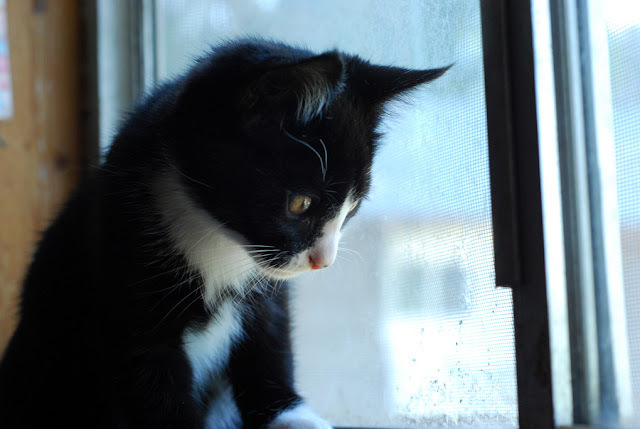 If I'm not careful I may blink and the weekend will be gone as well. While fussy cutting the mermaid I chose to do a slight bit of altering on her left arm by snipping it off and re-gluing it just a smidge lower so that the angle of her invisible shoulder looked more natural to me. It's a little thing but it makes me so much happier with the end result. That seaweed down at the bottom of the card is just a single Prima flower that I cut up and I think it grounds the scene in a clever way. 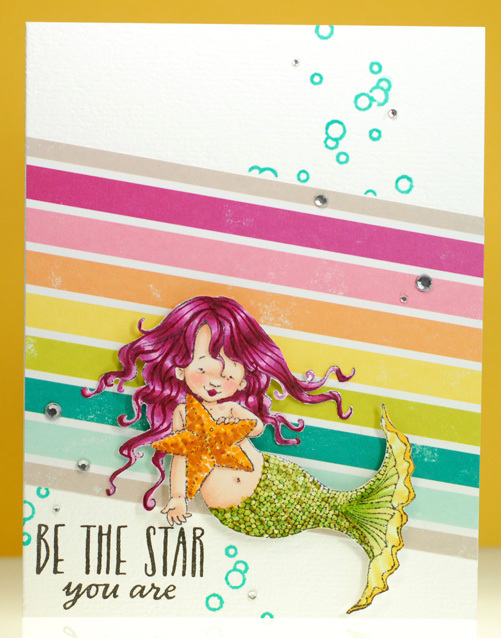 So I paired this merbaby and her starfish up with a colorful scrap of older Making Memories paper. This kinda-sorta rainbow stripe has been a long time favorite of mine and I know that I've already used it several times but I don't care. To me it just says summer, and girlie, and happy. Talk about a no-brainer. LOL! All the Copic colors were pulled from the paper and I really couldn't have been happier with the match on her hair. A few quick bubbles from the Fintastic Friends set finished off this CAS card. 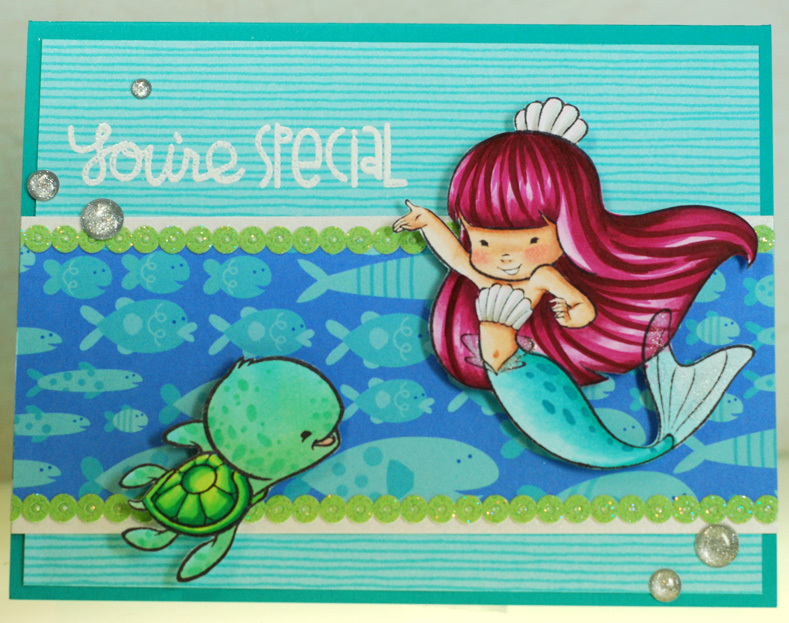 I've got a really fun card to share today that I made for the latest Kraftin Kimmie Saturday challenge which is 'anything goes'. I had colored up this enchanting mermaid from the Sea Jewels set on Saturday just so I could be ahead of the game later in the week. There was no paper pulled and no design plan, I just colored and fussy cut her out. Then the mail came and in it was the new Fintastic Friends set from Lawn Fawn. I had gotten it more for the fish and sentiments than anything else but as I was looking the set over the tank looked big enough to fit my little Sea Jewel into quite comfortably... thus an idea was born. Well the weekend was fantastic but it just flew by. We did end up going to Spokane and it became a whole girls trip as both of my sisters and mom were with me. Needless to say we had ourselves a very good time and didn't get back until late last night. I was smart though, and got a CAS card done on Saturday so that I could have a quick post today before I rush off to work. 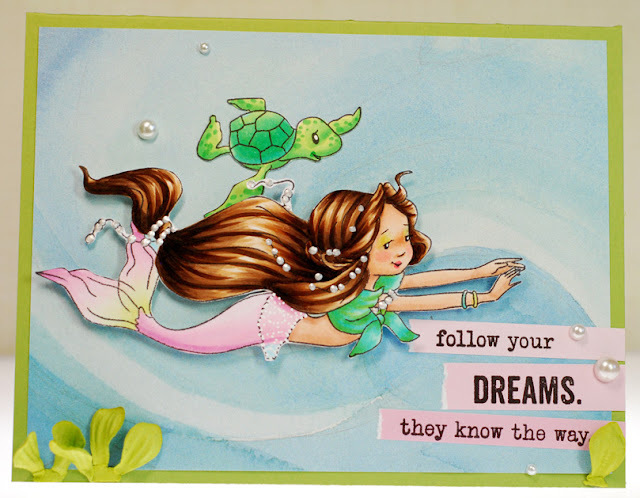 Today's mermaid comes from Some Odd Girl and she is called Mermaid Piper. 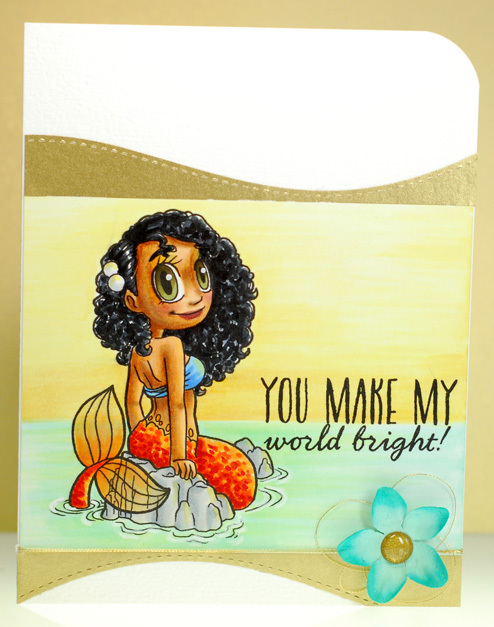 This lovely little lass looked to me like she makes the waters of the Bahamas her home so I gave her a beautiful, warm skin tone. Initially I pulled all my Copic colors from some pattern paper that turned out to be too busy with this peaceful looking scene and in the end I didn't even use it. 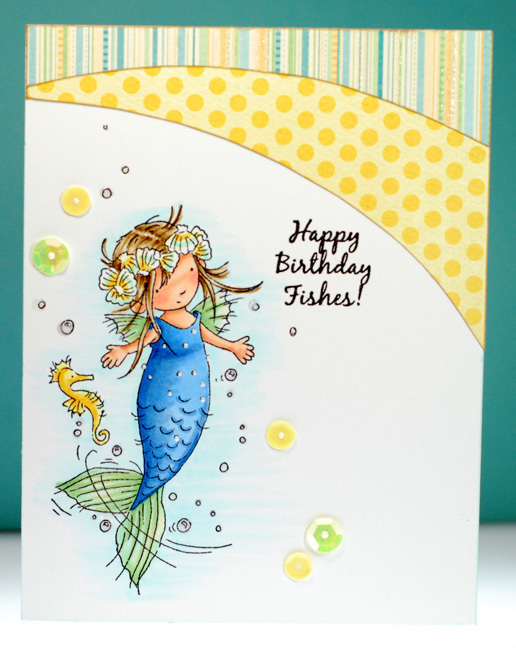 Instead some shimmery gold paper just looked right, a minimal amount of embellishing and this card was done. 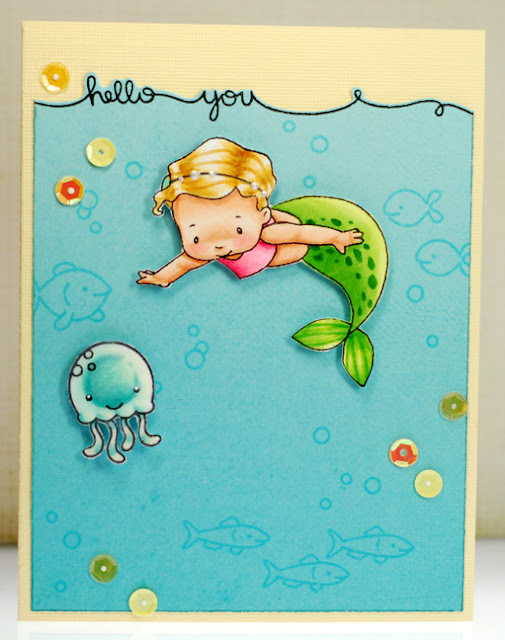 I have another card for the new month long Farm Fresh challenge over at The Greeting Farm to use buttons. There is no mention of how many cards we can or cannot enter within the expanded time limit so I'm just going with the flow and playing along until someone says otherwise. 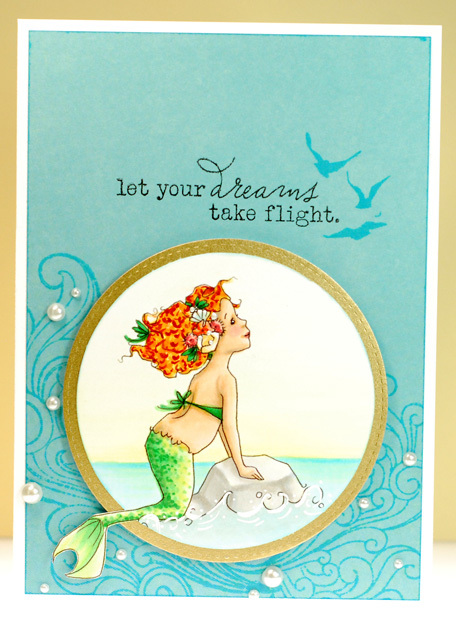 Once again I have another altered mermaid to share. This time I did a head (and arm) swap with Surfer Anya and the body of Mermaid Anya II. They had both just been sitting in a stack on my table and as I was sorting through images trying to find one that spoke to me these two just clicked. Talk about a super simple alteration, chop off Mermaid Anya's head and waving arm then glue the remaining finned body right on to Surfer Anya's old two legged body. 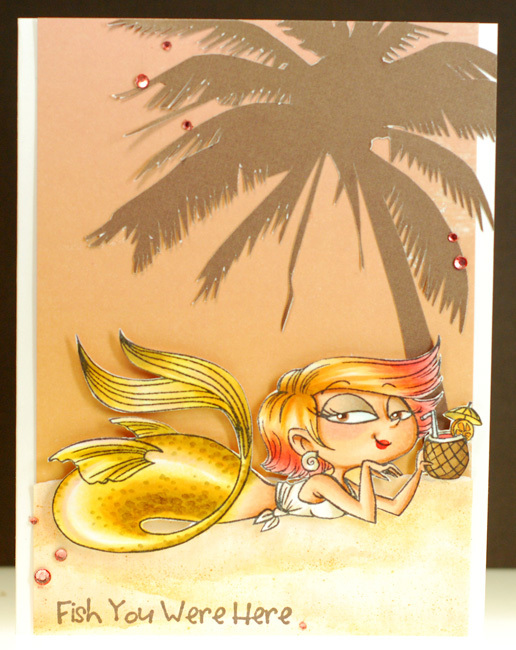 Fussy cut her out and voila... new Beachy Mermaid Anya. 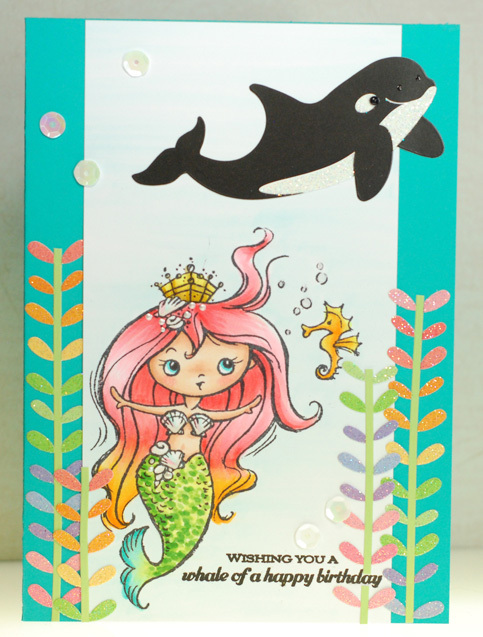 And yes, I grabbed a pink version of that Scrapbook Wizard bubble paper like I used on yesterday's card so the trend continues, LOL! Ok, I should really get moving... busy day ahead. Ta ta for now! I paired Aurora and Mr. Turtle with some older scraps of Doodlebug papers I found in my stash, that stripe even dates back from 2001... yikes! It can't be a good thing when your crafty supplies start making you feel old, LOL! Anywho, I really like how they both look like they are going against the flow which ties back to the sentiment nicely. Well, that's all I've got for today. Ok, time for me to mosey. Hope to see ya again tomorrow! 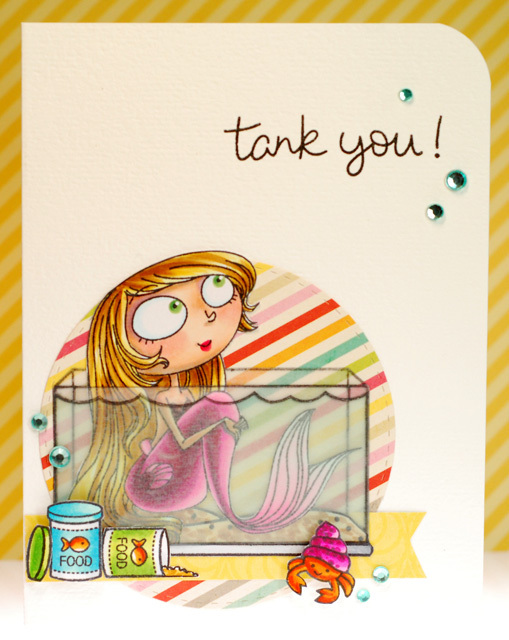 Today's mermaid comes from the Under the Sea set from Some Odd Girl. 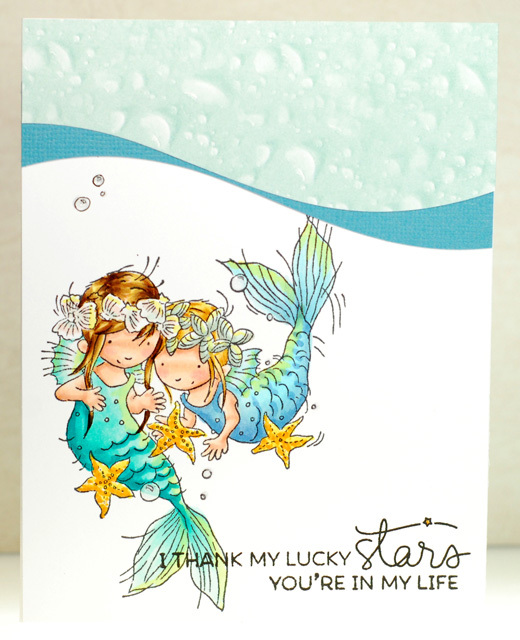 She's been stamped up and waiting to fulfill her card destiny for quite some time and while her sister was colored up ages ago this little lady hadn't been as lucky. But I think the wait was worth it because I know she wouldn't have turned out half as cool two years ago. 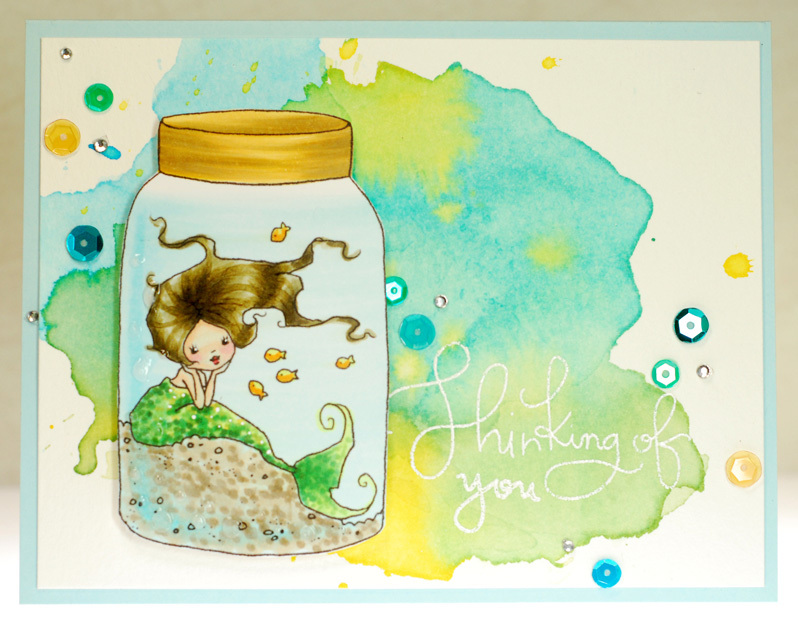 Well thanks for stopping by for day two of my month of mermaids. I'll be swimming by with another card tomorrow. As I mentioned on Friday, I've decided to do something a bit different this month and have all of the stamps I use follow a specific theme. So June is going to be the month of mermaids on the ol' Thousand Sheets blog! I realized recently that I have mermaid stamps from all but one of my favorite stamp companies and this will be a fantastic way to get more of them on to cards this summer. 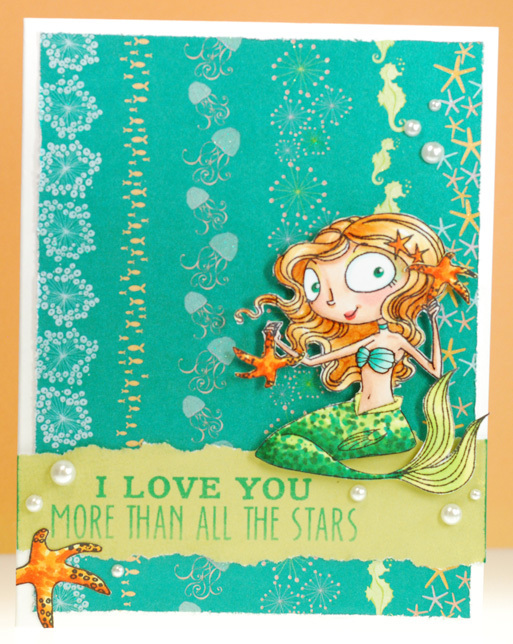 I used a Tim Holtz edge distressor to rough up the edges of that background paper and did a bit of paper tearing on the sentiment strip to fit the challenge. 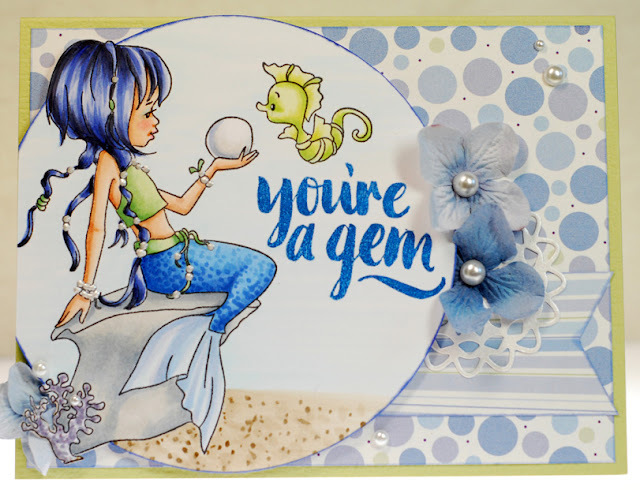 Then I found this great sentiment that is actually part of a different kind of star set from Hero Arts but it got my creative juices flowing even faster. I had needed something for Arielle to hold on to since her hands that had once been hanging on to a swing where now just raised randomly in the air and how perfect would it be to give her a few starfish to match that sentiment? I gotta say, I kinda love how this all came together. Ok, time for me to get this day going. So much to do, so much to do.